If you have a sweet tooth, these treats are just what you're looking for. Cocout and sugar never tasted so good. 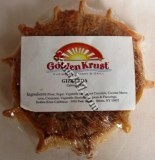 Grated coconut and sugar on a pie krust never tasted so good. You'll be munching all day on these tasty treats. It hardly gets any more traditional than this. These grated coconut snacks are delightful. Adults and children love them. A great way to satisfy your sweet tooth.